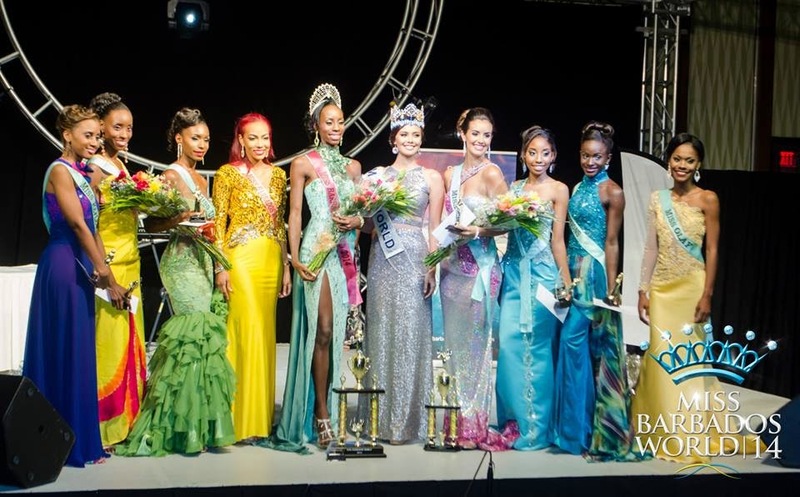 Zoé Trotman (2nd from right) was crowned Miss Barbados World 2014 at the Hilton Barbados Resort in Bridgetown on May 24th, 2014. She will compete in Miss World 2014 pageant scheduled for December 14 in London, England. In the photo, Trotman is flanked by (L-R) her 2nd runner-up Shakela Bellamy, 1st runner-up Melanie Mark, and the current Miss World 2013 Megan Young who assisted in the coronation. The new queen poses with her court, her predecessor Regina Ramjit (to her right), Miss World Megan Young, and the rest of the eight young women who competed in this year's pageant.